The Dorrigo area is blessed with an abundance of natural beauty and topping the list is some of the most impressive waterfalls in the country. 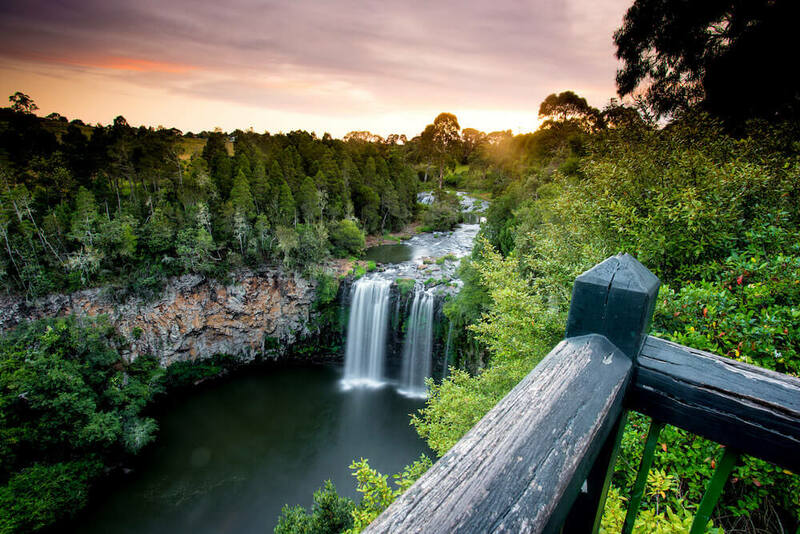 Waterfall Way has been voted as one of the best scenic drives in the state of NSW and stretches for 185 kilometres from the coast near Urunga, to Armidale in the west, and its along here that you’ll discover these magical falls. Some require a little bit of walking, some a decent hike, while others can be viewed from the comfort of the car. Dorrigo National Park offers countless hiking trails, a visitor information centre, a café, the Skywalk Lookout AND best of all, easy access to a couple of the area’s most beautiful falls. At 3.5 kilometres return, the walk to Crystal Shower falls is one of the shortest waterfall treks in the area but it’s a favourite for many, as it offers the chance to go behind the falls, a truly unique experience! A suspension bridge takes you right near the top of the falls, while a little side track will lead you to the bottom where you can stand right behind the water. From here, you can head back to the rainforest or continue a 6-kilometre loop known as the Wonga Walk, until you reach the impressive Tristana Falls, a cascade waterfall that is often overlooked. And while the shorter route, to the Crystal Shower Falls is clearly laid out with paths and boardwalks, if you’re feeling a little more adventurous the return trip is well worth the effort. Just past the rainforest centre is the Never Never picnic ground, the starting point for the strenuous 8-kilometre return trek to Red Cedar Falls. It’s a tough track and the return journey is entirely uphill, making it one of the more challenging hikes in the area, but the reward is Dorrigo’s largest waterfall. It delivers you to the base of the falls where you’ll feel the spray from wherever you stand, and to really freshen up there’s also a little swimming hole at the bottom. But for ease of access and pure natural beauty, Dangar Falls is the clear winner. Conveniently located just a couple of kilometres from Dorrigo town centre. Right beside the carpark, a platform lookout gives an impressive view of one of Dorrigo’s most iconic sights but for a closer view and a dip in the plunge pool below there’s a walking track all the way to the base of the falls. Head 50 kilometres west to Ebor to discover one of the country’s most beautiful, multi-step falls. Now simply known as Ebor Falls, the traditional land owners, the Gumbaynggirr people, named them ‘martiam’, meaning great falls and with look outs for both the upper and lower sections of the falls, just a short walk from where you park, they are easy to access and appreciate. While the main lookout brings you right up close, the second gives the best over-view, capturing the true magnitude of the falls, while a walking track continues to a third viewpoint, offering panoramic views of the National Park.